Do you know a Jeffrey? Jeffrey is an elementary student who has complex physical needs. It takes a lot of energy for him to control his body and communicate, therefore he fatigues easily. Consequently, his team determined that he would be a good candidate for a voice output eye tracking system with an 8-location display. 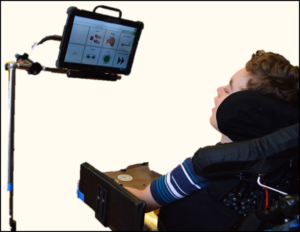 Prior to introducing the Universal Core vocabulary, Jeffery had access to his device with pages designed for specific topics and activities. He showed little interest or motivation to use the system let alone navigate to the pages he might need. Consequently, his educators typically found the needed page and then gave him a choice of two symbols from the page. He would either not respond or smile to indicate his choice. Jeffrey’s teacher made the decision to reprogram the device using nine pages. Each page had four Universal Core vocabulary words and additional navigation buttons for ‘go back,’ ‘more words,’ and ‘clear display’. Throughout the year, his teacher and classroom staff consistently modeled the Universal Core vocabulary on the classroom size 36-location board as well as on his device. They would say things like, “If I want to say, turn, I can look at the words on each page for the word turn. Let’s see if it is on this page?” They would then point to each symbol and say the name. When the word being modeled was not on the displayed page they would say, “No, it’s not on this page so I need to look at ‘more words’ to go to the next page,” and then point to and say the words on the next page. When they found the word, they would say, “Here it is, I need to look at this word to say turn.” Across the year, Jeffrey became increasingly more interested in communicating using his device to engage with peers and adults about academic and non-academic activities.